MK116 MOD 1-M: 4 lbs. 9.5 oz. MK116 MOD 2-M: 4 lbs. 7.8 oz. The PWS MK116 Piston Upper features a high-quality 16.1-inch stainless steel barrel chambered in .223 Wylde, it is capable of handling both .223 Rem and 5.56 NATO ammunition with great accuracy. When you marry the Wylde Chamber with an evolved long stroke piston system you get an upper that’s hard to beat at the range or in the field. The MK116 is long enough to skip the NFA short barrel circus without a muzzle device. It responds to a variety of duties and applications with commendable results, even out to 500 meters. The PWS MK116 is based on the innovative MK1 upper system, one of the most reliable piston AR upper on the market. The long stroke piston AR design of the PWS MK1 marries the flexibility of the AR platform with the proven reliability of the AK-47. It’s better than a genetic experiment, this is a crossbreed that works. The MK1 features advanced reliability, less intensive maintenance and excellent duty life. Since the BCG and free-floating piston system are joined with an operating rod, there are fewer individual moving parts and less opportunity for failure. If you’re a dyed-in-the-wool forward assist guy, choose the PWS Mod 1 upper. It has plenty of advanced features that raise it above the crowd and the reliability of the long piston AR upper but it’s not such a great departure that you’ll feel alienated by your own weapon. 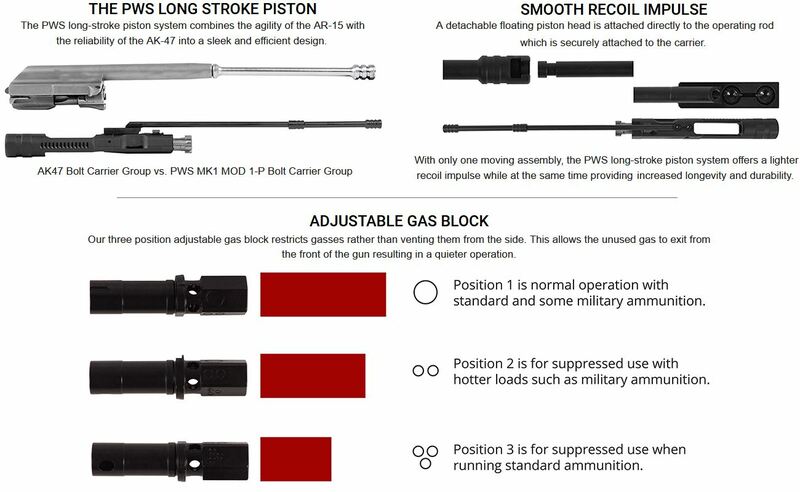 Those who are ready to jump into the evolution of the AR system feet first are ready to give the PWS MK1 Mod 2 a run. You won’t be disappointed. The PWS Mod 2 continues the progress made by the Mod 1 and takes another leap forward. In addition to quality surface treatments (FNC LIFE HD,) free floated M-LOK handguards, and integrated QD mounts, the PWS Mod 2 includes PWS’ own PicMOD® combination rail that accepts both Picatinny and M-LOK Accessories. The forged upper itself is trimmed down, machined down to drop weight and bulk while maintaining exceptional strength. The additional mass reduction comes from dropping the traditional forward assist which just isn’t practical when your upper cycles as reliably as the MK1. Gas management is a simple matter of choosing the correct position of three offered on the adjustable gas block, a simpler matter than the variable adjustments offered in the previous MK1’s adjustable gas block. Either way, you climb, you’re above the competition on the evolutionary ladder. Choose a Primary Weapons Systems MK116 for your next build or upgrade. Because It’s Time.